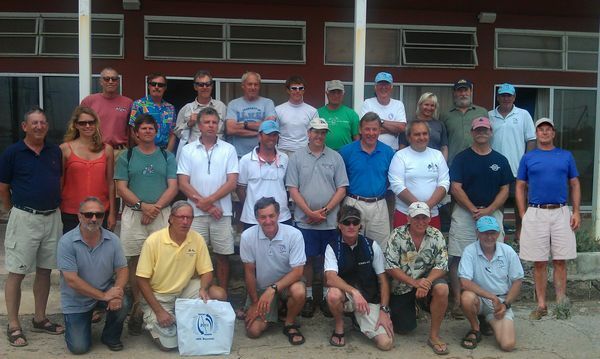 Singlehanded skippers raced from Newport to Bermuda, started Friday, June 3, 2011. The race back from Bermuda to Newport, started Thursday, June 16, was doublehanded. Standing Up Top Row L to R: Murray Danforth, John Drozdal, Gust Stringos, Douglas Shearer, Jonathan Green, Ray Renaud, Peter McCrea, Diane Reid, Philippe Laville, Dave Sherman. Standing Up Middle Row L to R: Louis Meyer, Lindsay Lowe, Patrick Jones, Brian Flynn, Steve Tofield, Timothy Allen, D. Scott Miller, Fred Cosandey, Rick McCally, John Lubimir. Kneeling L to R: Michael Schum, Pieter de Zwart, Roy Greenwald, Jay Sharkey, Erick Johnson, Roy Guay. Missing from photo: Tristan Mouligne, Andrew Tyska, Christian Reimer, Michael Dreese.